Mori Lee - Style 5406 is a classic example of a ballgown wedding dress. It also had a sweetheart neckline. Sincerity - Style 4000 is a typical tea length wedding dress. Mori Lee - Kayla 8224 is a dramatic example of a fishtail wedding dress. We also stock a few more ‘relaxed fishtail’ styles with not so full skirts. 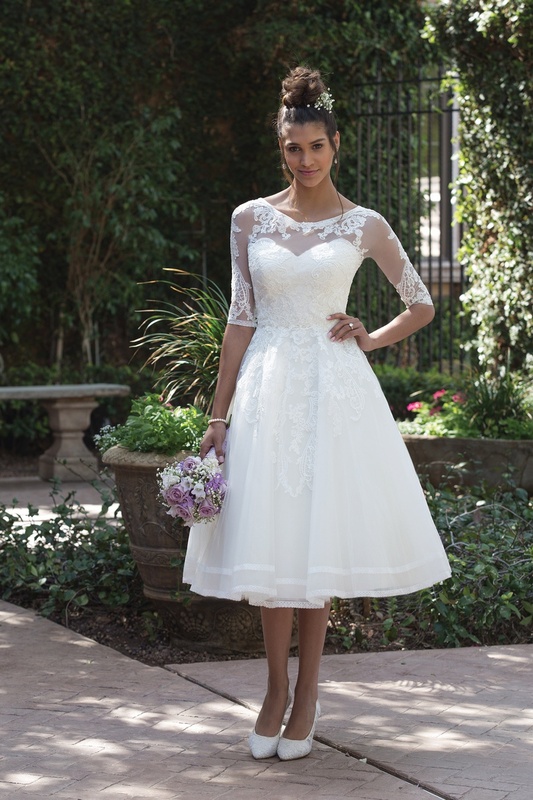 Sweetheart - Style 1122 is a good example of a Queen Anne neckline, with a more modern feel using illusion lace detailing. Mori Lee - Karlee 8207 is a stunning example of illusion lace detail on the neckline and arms, see how it looks like the lace is floating over the skin. Sweetheart - Style 1139 has a subtle train, known as a sweep train. Sincerity Style 3938 has a beautiful chapel length train. Most of our gowns are a chapel length as it’s the most common style of train. Fishtail / Mermaid Wedding Dress - A form fitting dress which flows into a large skirt starting around the knee to create a mermaid or fish tail silhouette. Ballgown / Princess Wedding Dress - A dress with a large layered skirt starting from the hips. Cinderella and Sleeping Beauty's iconic dresses are classic examples. Tea Length Wedding Dress - A Tea Length Wedding Dress is a dress with a fuller knee length skirt. They tend to be 1950's vintage inspired. Ilusion - Skin coloured net with embroidery used to create the ‘illusion’ of embroidery floating over skin. Sweetheart neckline - When the neckline dips towards the bust creating an almost heart shape. Bateau / Sabrina neckline - 'Bateau' is French for 'boat' so it literally means boatneck, which is more elegant than it sounds on paper! It's a high neckline that follows that shape of your collarbone. Meghan Markle wore a classic boatneck wedding dress for her 2018 Royal Wedding. Queen Anne neckline- A Queen Anne neckline is a dress with a higher collar at the back and a scoop, V-neck or sweetheart at the front. Sweep train - A Sweep train is the shortest of trains; at around 6 inches long it's a subtle way to add a bit of tradition to a gown. Perfect for the wedding reception dancefloor or an outdoor wedding! Chapel train - A Chapel train is between 12 and 18 inches long. It is the most common style of train as it's just long enough to add a bit of drama, but short enough to allow low maintainence movement. Cathedral train - A Cathedral train is the longest for most wedding dresses, measuring from 22 inches. For making an entrance with real impact, they look stunning in wedding venues with a long aisle. Royal / Monarch train - Serious trains, timewasters need not apply. A Royal / Monarch train does what it says on the tin. Princess Diana's 25 foot train was a classic example.